The evening felt special right from the moment I miraculously found a parking space a mere block from my destination. The fog that threatened to shroud the entire city in its cold, damp blanket couldn't quite push past the hills surrounding the Castro. A circle of clear, darkening sky hovered above the bustling neighborhood. A crescent moon smiled down from the middle of the circle. A bright star twinkled next to the moon. Magic was in the air. For months I'd heard about how wonderful the Castro Street Farmers Market pick up was. Last Wednesday, I went to see for myself. Food Runners volunteer Ora S. and her husband Dan H., a truly renaissance couple who'd done the run often, arrived right on schedule. They parked their trusty, dusty but not quite rusty 1982 Volvo station wagon on the corner of Beaver and 16th. They stepped out of the car bubbling with excitement. The Castro Farmers Market was their favorite food run. "What's first?" I asked. Dan showed me where to get a cart. "There's always a ton of food," he said. "The farmers here are so generous. It's just fantastic." "Sometimes we bring our son along," Ora chimed in. "Once the car was so full that Dan and Nathaniel had to walk home!" 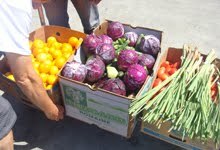 We wheeled the cart past a table overflowing with fat, ripe heirloom tomatoes in many shapes and colors. Perfect produce fanned across the tables at every booth. "Wait a second," Dan said stopping in his tracks when Vidal of Bautista Ranch waved him over. "I forgot the books," Dan fretted. With that, he ducked back into the Volvo returning with a stack of children's tomes that he'd authored. "I hope your kids like these," Dan remarked as he signed the volumes. Vidal thanked Dan before piling several boxes of succulent plums on the cart. "We've loved getting to know all the vendors," Ora elucidated. "It just makes the job more fun. They are such an interesting and diverse group and they care so much about giving back." As we strolled past table after table of amazing organic fruits and vegetables, farmer after farmer stacked donations onto the cart. We made numerous trips back to the Volvo. Happy Boy Farms donated beans and broccoli. Far West Fungi donated tender mushrooms of several exotic varieties. 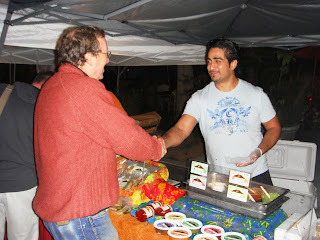 Saleem at East and West Gourmet gave tubs of delicious hummus as well as bolanis and more. "I'll bring those writings I promised you next week," Dan told Saleem shaking his hand. "Saleem is Afghani and we've been exchanging philosphy," Dan explained. "Avez-vous quelque chose ce soir ?" Ora asked the silver haired vendor from Crepes & Brioche as he packed up his truck. Oui, oui," he replied handing down several bags of crusty, aromatic baguettes. "He doesn't speak any English," Ora informed me. "How lucky that you and Dan speak French," I observed in admiration. 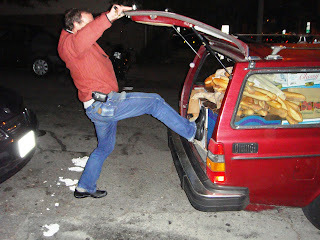 After we'd made the rounds of all the vendors, we returned to the Volvo to load up. We stuffed every nook and cranny except Dan and Ora's seats. Ora tried to close the back hatch, but it wouldn't latch. "Dan," she implored. "I need your muscle." Dan placed his shoe on one of the boxes and gave it several healthy shoves. The hatch closed at last. I followed Dan and Ora to the Father Alfred Center in SOMA for the delivery. The Father Alfred Center is a live-in drug and alcohol rehabilitation program providing a "safe and supportive environment in an urban residential setting." The clients were waiting for us with smiles and had the Volvo unloaded in minutes. In an email to me a few weeks previous to my tagging along, Ora summed up the Castro Market run like this: "The vendors were amazingly generous. The wagon was packed to the gills with the most gorgeous peaches, beans, breads, cheeses, tomatoes, eggplant, flats of strawberries, kale and on and on. The delivery was very easy. Totally life affirming." Totally life affirming. Ah, the beauty of Food Runners! 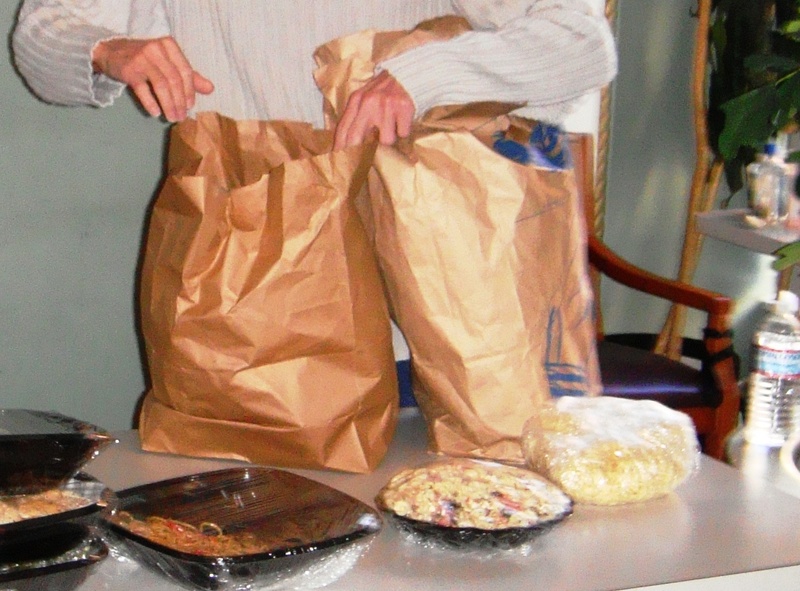 Food Runners picked up and delivered 114, 320 pounds of food during the month of September. Volunteers performed 846 runs and the truck did 222. Please welcome September's new donors Town School for Boys, Foods by Jude, and the Divisadero Farmer's Market. Many, many thanks to Tante's Special Events and Catering for all their great donations following a slew of September's outdoor events and festivals such as Opera in the Park, Tour de Fat, Now and Zen, Folsom Street Fair and more. Thanks as well to Green Mary who encourages food vendors at street fairs and other local outdoor events to donate their excess food to Food Runners. Look for Green Mary and her crew the next time you attend such an event. They will be by the dumpsters sorting the compost from the recycling from the garbage in an effort to alleviate waste. Holiday season is almost here and that means parties. Parties here, parties there, parties everywhere. Want to give your hostess a truly unique and inspired gift? Tell her about Food Runners and give her a beautifully wrapped box with a card inside displaying Food Runners phone number, 415-929-1866. You'll be giving her the opportunity to do something meaningful when the party's over. And if you're the host, give yourself the same gift. Either way, your holiday spirit will soar. They speak softly in melodious French accents. They wear long flowing habits, the kind rarely seen anymore except in movies or medieval paintings. Heavy crucifixes dangle from their slender necks. They are tireless. They are devoted. They are Sister Marie Madeleine and Sister Marie Isabelle of the Catholic religious order, Fraternite Notre Dame. Together, these petite, shy young women operate a fantastic soup kitchen at 54 Turk Street near Market, one of the roughest and most downtrodden areas of the Tenderloin. The Order's mission is "to provide help to the least ones and to the poor." The Sisters are doing just that week after week in amazing fashion. The day that Food Runners founder Mary Risley and I met the Sisters, they bowed their swaddled heads while ushering us into the tiny, cheerful, apple-green dining room fronted by long windows with pointelle lace curtains spilling from ceiling to floor. Sister Marie Madeleine offered us juice and homemade cookies before giving us a tour of the freezer, the reach-in and the spotless, stainless steel kitchen. The Sisters cook and serve an astounding two to three hundred meals per day every Tuesday, Wednesday and Thursday. They gather the food and prepare the meals predominantly themselves aided only by a few volunteers like "Uncle Dickie" an older gent from the immediate neighborhood who enjoys doing something that matters. Mary's and my motive for stopping by that day was to find out how Food Runners could help. Three hundred meals, three times a week adds up to a lot of slicing, dicing, simmering, boiling, stirring, pot-watching, menu planning, organizing and cleaning up to say nothing of the masses amounts of food required to feed so many people in need. "Are you getting enough food?" Mary asked. "Oh, non," Sister Marie Madeleine replied in her accented English shaking her head and looking at the floor. "What kind of food do you need most?" Mary inquired as she nibbled a buttery flower shaped cookie. "Chicken," answered Sister Marie Madeleine without missing a beat. "We can use fruit too and milk. And vegetables" she continued. Mary turned to me. "Can you get the Food Runners truck here Monday, Tuesday and Wednesday mornings?" I nodded. "We can deliver chicken on the last few Mondays left of the meat program you set up in March," I offered. "And we sometimes get chicken from Trader Joe's. I can send that when we get it. I can send produce on Tuesdays," I said rifling through the daily donation lists in my head. "What about the Satruday Farmer's Market?" queried Mary. "Couldn't Keith add Fraternite to his other deliveries? Is anyone here on Saturday afternoons, Sister?" "Oui... I mean, yes," blushed Sister Marie Madeleine. "But only after 3:30." "That should work," I chimed. "I'll give Keith a call." "Do you need sweets, Sister?" Mary asked. "Yes, sweets would be nice," Sister Marie Madeliene replied. "I think the people would enjoy sweets." "I know just the thing," I piped up excitedly. "One of the volunteers picks up from Kara's Cupcakes and Miette Cakes every Monday. It's usually a good amount too. I'll have her start bringing it here." 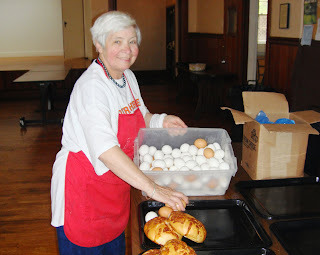 As we wrapped up and sorted out logistics, Mary asked Sister Marie Madeleine how the kitchen got started. "Our founder saw a need in San Francisco and he sent us here to fill the need," came the answer. 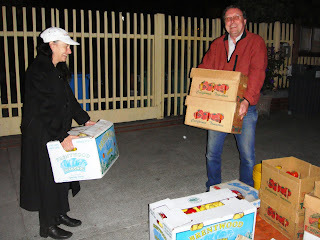 Food Runners saw a need too and is proud to be sending food to Fraternite Notre Dame four days a week in support of their extraordinary work feeding the hungry of our community. Good is as good does and delivering to the Sisters is all good. 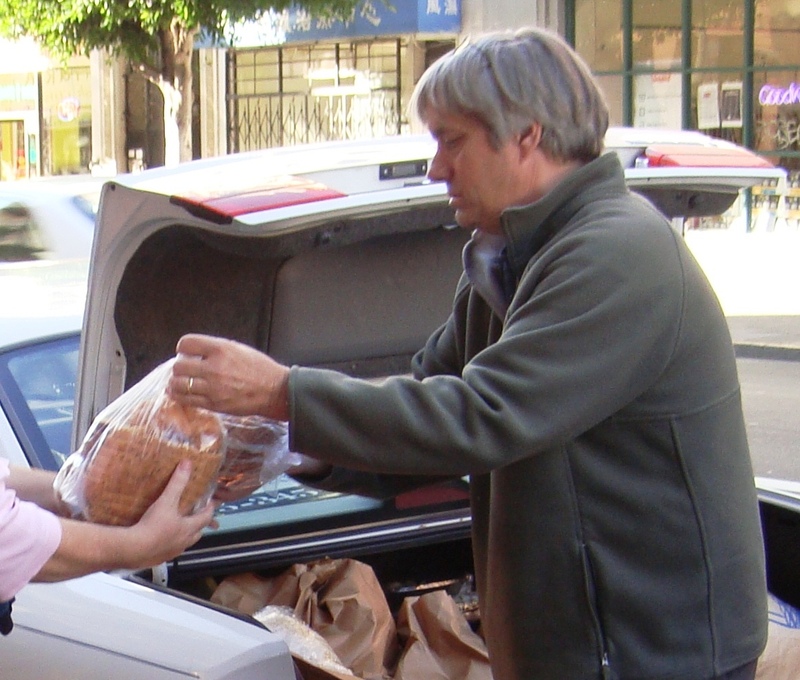 Food Runners picked up and delivered 117,450 pounds of food during the month of August. Volunteers performed 843 runs and the truck did 191. Food Runners welcomed four new donors in August including San Francisco Zoo's Taste of the Wild Catering. Many thanks this month to Events Etc. Catering for their fabulous donation of over 1,000 pounds of top o' the line gourmet barbecue left over when only 900 of the expected 1,500 guests showed up for a corporate picnic. Other caterers who called Food Runners with considerable donations in August included Paula Le Duc Fine Catering, Melon's Catering, Knight's Catering, Taste Catering and Living Room Events. Event attendance may be down, but that just means more food for Food Runners! Do you have school age kids or grandchildren? September is Back to School time and that means the advent of school fundraisers. 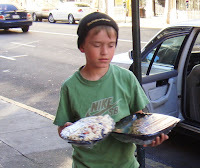 Have you ever been to a school fund raiser that didn't have too much food? Tell your child's school Events Committee about Food Runners. 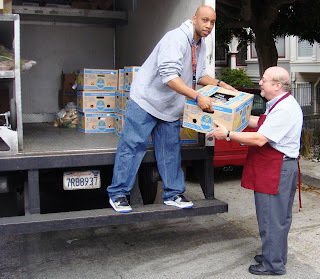 A simple phone call to 415-929-1866 will make a smiling Food Runners volunteer appear at the end of the big soiree to whisk away the leftovers and deliver them to a San Francisco shelter or food program in need. Good for you. Good for your school. Good for your community. Esther prepares the fruit salad. Ann concocts the savory salad. Pearl boils the eggs; 50-60 of them at a time. Casey lays out the bread. Sheila, Phil and Myron share the head chef duties on rotating Saturdays, planning the menus, choosing the recipes and directing the cooks. Joan, who buys the weekly supplies of plates, cups and utensils (all compostable, thank you) has the most celebrated job of the morning: starting the coffee. All the while, as she has done for the past fifteen years, sweet, petite, silver-haired Lisa directs the entire operation, darting from station to station speaking in her Belgian accented Dutch with her eyes all a-twinkle like a merry leprechaun. This is the bustling scene you will find on any given Saturday as an all volunteer crew prepares the Saturday Meal at All Saint’s Episcopal Church on Waller in the Haight. For more than 20 years, All Saints has served the local community's poor and homeless population by providing a free, hot, nourishing meal served every Saturday morning at 10:30. They serve an average of 200 meals each week. 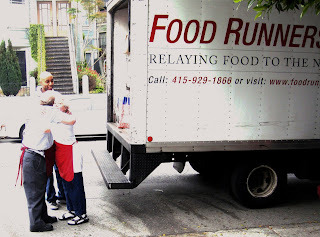 The majority of the food for the Saturday Meal is delivered by Food Runners. At around nine o’clock every Saturday morning, immediately after loading up hundreds of pounds of donated food from Trader Joe’s on Masonic, the Food Runners truck, rumbles up beside the pretty, shingled church with the smart white trim. Food Runners weekend driver, Edgar, greets Lisa and the Chef o’ Week with a smile. Edgar loves delivering to All Saints. Lisa and the Chef follow Edgar to the truck to choose what they need from what’s on board, always being careful to take only what they will use, leaving the rest to be delivered to other organizations. A church volunteer loads everything onto a blue cart and wheels it inside where the items get divided into what can be used that morning and, as in the case of meat that can’t be prepared in time for that day’s offering, items to be frozen and used the following week. The line to partake of the meal begins forming as early as 8:30AM. 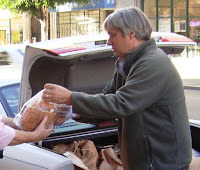 Just as the Food Runners truck pulls away, a Food Runners volunteer arrives with a load of individual sized loaves of soft, fresh bread donated by the Academy of Science’s The Moss Room. Doors for the meal close at 11:30. The bread from The Moss Room along with bananas (there are always lots of bananas) and individually packaged salads from Trader Joe’s are distributed to folks who arrive late and/or those in need of a little something extra beyond the meal to take home. All Saints’ Episcopal Church is aptly named. All the folks who contribute to the Saturday Meal Program whether they be church volunteers, Food Runners volunteers or Food Runners donors, are all saints indeed. Food Runners picked up 117, 025 pounds of food in the month of June. Volunteers performed 870 runs and the truck did 203. Please welcome July’s 10 new donors including The Box Lunch Company who donated 1,600 pounds of frozen, sliced turkey on their first donation. Also welcome the delicious and nutritious donations from the Ferry Building Market Place’s newest market being held on Thursday afternoons. Last week’s nectarine donation was juicy and copious! Speaking of farmer’s market’s, the Wednesday evening Castro Street Farmer’s Market is now donating enough fresh produce to necessitate sending two Food Runners volunteers in two cars in order to fit in all the donations. Way to go farmers! Do you know of a business that’s throwing away food? Help them be green and community focused. Tell them about Food Runners. Think how wonderful they will feel knowing that a Food Runners volunteer delivered their excess food to a program like the All Saints’ Episcopal Saturday Meal Program.